For the military operation, see Operation Doppelkopf. A 40-card Doppelkopf deck (i.e., without nines). Doppelkopf (German pronunciation: [ˈdɔpl̩kɔpf], lit. double-head), sometimes abbreviated to Doko, is a trick-taking card game for four players. The origins of this game are not well known; it is assumed that it originated from the game Schafkopf. In Germany, Doppelkopf is nearly as popular as Skat, especially in Northern Germany and the Rhein-Main Region. Schafkopf however is still the preferred trick-taking variant in Bavaria. Unlike Skat, there are numerous variants. Although the German Doppelkopf Association (Deutscher Doppelkopf-Verband) has developed standard rules for tournaments, informal sessions are often played with many variants and players adopt their own house rules. Before playing with a new group of players, it is therefore advisable to agree on a specific set of rules before the first game. Note: In the following section, the most common rules are described. Doppelkopf is a team game where each team normally consists of two players. The most distinguishing feature of the game is that, as in Schafkopf, the actual pairing is not known from the start, which is what makes the game interesting for most players. Each set of 8 cards consists of 2 cards from each suit; if French-suited cards are used the suits are Diamonds ♦, Hearts ♥, Spades ♠ and Clubs ♣. Thus each card exists twice in the deck (hence the name Doppelkopf) resulting in a total number of 240 points. In the ensuing description, the more common 48-card version is assumed. The rules for the 40-card variant are the same, the only difference is that the Nines are removed. If German-suited cards are used, the suits are: Bells , Hearts , Leaves and Acorns . The Ace is replaced by the Deuce or Daus (A), the Queen by the Ober (O), and the Jack by the Unter (U). In every game, there are two parties, called Re and Kontra. To win, the Re team normally has to achieve 121 points or more; Kontra wins when Re fails to do so. Each player is dealt twelve cards, or ten in the 40-card variant. After the cards are dealt, the kind of game is determined. In non-tournament play, it is assumed that a normal game will be played and any player desiring a different game simply says so. In tournament games, a more complicated method is used to prevent players from gaining information about their opponents' hands. The types of contract that can be played only differ in which cards are considered trumps. When a player declares a game other than the normal game, (s)he alone is Re and has to play against the other three players who form Kontra. These non-standard games are, therefore, called Solo games. In the normal game, the players who hold the Queens of Clubs (Die Alten = "The Old Women" or "The Elders") or Obers of Acorns constitute Re, while the other two are Kontra. In these games, the actual teams are not known from the start. In case a player has both Queens of Clubs or Obers of Acorns, (s)he declares a Marriage (Hochzeit). The player to the left of the dealer, forehand, leads to the first trick; the other players follow in a clockwise direction. Each player must follow suit, that is, play a card of the led suit. If he is unable to do so, he can play a trump or any other card. The player playing the highest trump or the highest card in the led suit wins the trick and leads to the next trick. Since each card exists twice, there is the possibility of a tie; in that case, the first-played card wins the trick. For example, when the trick consists of ♠10 ♠A ♠9 ♠A, the player who played the first Ace of Spades wins the trick. During the first trick, each player may make announcements which increase the value of the game. After all the cards have been played, the point values (card points) of the tricks are counted and each player in the winning team gets the game value (game points) added to his score, while the losing players have that value deducted. This is sometimes referred to as the auction or as bidding in some variants - when this is referred to as bidding the section below on bidding is referred to as announcements. Choosing a contract consists of a single round starting with fordhand to the dealer's left. Each player says either "okay" (Gesund = "Healthy"), meaning that they are content to play a normal game, or "Special" (Vorbehalt = "Reservation") meaning that they want to play some other type of game. If one or more players have said "Special", they each in turn say what type of game they wish to play. Whoever has the highest ranking "Special" plays their game (the first player in bidding order winning in case of a draw). The Ten of Hearts (often called the Dulle) is the highest trump in every normal game as well as any Suit Solo. Except for Hearts solo, there are actually more trumps than non-trump cards. One noteworthy result of this rule is that there are only six non-trump cards left in Hearts, making this suit more likely to be trumped in the first trick it is played. When a player has both Queens of Clubs or Obers of Acorns, he usually declares "Marriage" (Hochzeit) and will form a partnership, the Re team, with the first other player to win a trick. Apart from this, the game is played like the normal game. If, however, the player who declares "Marriage", makes the first three tricks, he will instead play a Diamond Solo game against the other players. The player can also decide not to announce Marriage, in which case he plays a silent Solo (stilles Solo). This is played like a normal Diamond Solo; the only difference being that the other players do not know from the start they are playing against a Solo. Apart from this, the game is scored like a normal Solo (times 3 for soloist, normal for all others). A player can, if he wants to, announce a Solo game. These games change the status of trump cards; the player also must play against the other three players. He will get thrice game value added (or subtracted) from his scoreboard in case of a win (or a loss). Suit Solo or Trump Solo (Farbensolo) which makes the announced suit along with Jacks and Queens/Obers and Unters trump cards. A "Diamond Solo", therefore, has the same trumps as in a normal game. During play, a player may make announcements claiming that his team will succeed in achieving a specific goal. These announcements increase the game value regardless of whether they are fulfilled. If a team fails to accomplish the self-given goal, it has automatically lost. Apart from increasing the game value, the bids fulfill the role of clarifying which side a player who makes them belongs to. "Double" (Re) or "counter-double" (Kontra), announcing that the player is part of the Re (Kontra) team and his team will score more than 120 points. Note that this means that, in the case of an announced Kontra, the Kontra team must now make 121 points instead of 120 to win the game, unless Re is also announced. Either of these announcements also tells all other players whether they play against or with the announcer. Each of the following announcements can only be made after Re or Kontra. If, for example, Re was said and a player of the Kontra team wants to make an announcement, he also has to announce Kontra. If Re was announced by one player and his partner wants to make an additional announcement, he also has to identify himself as being on the Re team before being able to do so. No 90 (Keine 90), often abbreviated to "no 9" (keine 9), meaning that the opponents will get less than 90 points. Each announcement implies any previous announcements, for example, "no 60" implies "no 90" and "Re"/"Kontra", increasing the game-value by 4 (for the standard rules) points. Every bid may be countered by "Kontra" resp. "Re" when the opponents think the goal will not be met. For example, if the Re-Party announces "Re, no 60", a reply of "Kontra" simply claims Kontra will score 60 points. A Re or Kontra can be made with 11 cards left (that is, before the player plays his second card; it does not require the announcement to be made before the first card of the second trick is played). For No 90, 10 cards must be held. 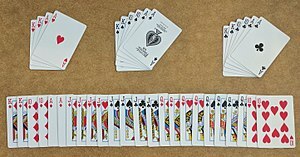 A player that has, for example, announced "Re", but not "no 90", may not announce "no 60" with 9 cards left, because the implied "no 90" would not be legal. A Kontra/Re in response to a bid of the opposing team may be made until one trick later, e.g. a player can say "Kontra" in response to "Re/no 90" as long as he holds 9 cards, regardless of when "Re" and "no 90" was announced. When, in the case of a Marriage, the partner is found with the second (third) trick, all players need to hold one card (two cards) less than in a normal game in order to make their announcements. Also, it is not allowed to make an announcement before a partner has been found. The official rules distinguish between "Ansagen" (announcements) and "Absagen" (lit. rejection, but probably used as a pun). There, an initial "Re" or "Kontra" is a "Ansage", and all other announcements ("keine ..." and "schwarz") are "Absagen". Unless a solo is played, the following additional score points can be made during the game, which affect the game value. There are no extra points in a solo game, not even in a silent Solo (when a Marriage is not announced). If a team's Ace of Diamonds, known as the Fox (Fuchs), is won by the opposing team, the opposing team scores an extra point. A trick containing 40 or more points (4 Volle, i.e. tens and aces) scores an extra point for the team that collected the trick. If a team's Jack of Clubs, dubbed Charlie Miller (Karlchen Müller) wins the last trick, the team scores an extra point. The game value is added to the score of each player in the winning team, and subtracted for the losing team. If the game was a solo game, the soloist gets thrice the game value added or subtracted. This rule ensures the total sum of points won/lost in a round is always zero. The following examples show the scoring as stated in the official rules. No bids were made, Re wins with 131 points. Both Re players get +1, both Kontra -1. Kontra, no 60 was announced, Kontra gets 183 points. Both Kontra players get +8, both Re -8. Re, no 60 was announced, Kontra team said Kontra. Kontra gets 60 points and therefore wins. Re, no 60 was announced, Kontra team said Kontra. Kontra gets 90 points. Both Kontra-players get +9, both Re -9. A Soloist wins without announcements with 153 points. Soloist gets +6, all others -2. Soloist announces Re, keine 90 but only manages to get 87 points for himself. Soloist gets -18, all others +6. Suggested tactics shown here come from the Pagat website. The first of equal cards wins rule makes it important to lead your ace of a non-trump suit before an opponent can lead theirs, as the second round is almost certain to be trumped - there are only 8 cards in a suit (6 in hearts). Avoid leading a second round of hearts, because of the danger of giving a ruff and discard to the opponents, since there are only six cards in the suit. lead an ace from a pair. If you are on the Re side you will normally lead a trump to your partner's ♣Q. If on the Kontra side you may lead a side suit. However, if your partner has said Kontra you should lead a trump as they should have at least one ♥10. If you are trumping in, and there is a possibility of being overtrumped, trump with at least a Jack so that the fourth player cannot win with a Fox or 10 of trumps. Similarly, if trumps are led then if you are the last player of your team to play to the trick, with one or both opponents after you, play a Jack or higher if no high card has been played so far. It is important that you announce Re or Kontra if things seem to be going well, not only to increase the score for the game but also so that you can announce no 90 if things continue to go well. Announcing Re or Kontra earlier than you need to, for example on your first play rather than your second, this indicates a possession of additional strength (similar in concept to jump bidding in Contract Bridge). If on the opening lead the fourth player says Re or Kontra before second hand plays, this indicates that they are going to trump the lead and want their partner to put a valuable card on it. It is generally correct to announce a marriage - and rarely profitable to go solo instead. It is desirable to partner with a marriage as your partner has at least 2 high trumps. Leading against a marriage you might lead a ♥10 to win the trick; otherwise you could lead an ace in your shortest suit. When considering a Solo, the initial lead is a big advantage. Trump Solos require a much stronger hand than you think ... these hands will also play well in a normal game. For an Ace Solo, a five card suit to A A 10 will normally capture over 60 points. For a Queen or Jack Solo 4 trumps are sufficient with a reasonable number of Aces. See also note on Solo games in tournament play below. Care must be taken with 90/60/30 announcements as they change the target. It can be very rash gambling 1 extra point against the possible loss of the whole game. It is highly likely that a player will not get a hand warranting a solo bid during the session. A compulsory solo, particularly towards the end, should almost always have Kontra said if declarer does not say Re to increase the game value when the soloist loses. A person with three or fewer trumps can say "Special" (Vorbehalt) and then announce "Poverty" (Armut). If no one has a better Special, the person announcing Poverty places three cards containing all the Poverty player's trumps face down on the table. A player who wishes to partner (preference being given clockwise from the Poverty player - if nobody wishes to partner then the hand is redealt by the same dealer) the Poverty player has the right to take these three cards (without seeing them first) and then discard any three cards, which are returned to the Poverty player. The returned cards may contain trumps and may include cards originally passed. Many groups remove the nines so that there are 40 cards left. This way, there are no more dummy cards and the balance between trumps and non-trumps is shifted even more towards trumps. Such a game might be called Sharp Doppelkopf (scharfer Doppelkopf) or "Without Nines" (ohne Neunen) or "Without Blanks" (ohne Luschen). Some variants allow the Wedding (Hochzeit) player to announce a specific kind of trick that must be taken, e.g. the first non-trump trick. However, this is usually not a good idea since it is in the interest of the Wedding player to find a "strong" partner, e.g. one with a Ten of Hearts. It may be agreed that - as the only exception - the second Ten of Hearts is considered higher than the first, if both are played in the same trick. In some variants, this is true for all but the last trick, where the first Ten of Hearts is considered higher. Playing this variant makes the game less predictable because some conventions (such as playing a Ten of Hearts in the first trick by a Re player, or to marry a Wedding player) cannot be used anymore. If a player collects 30 points or more in the first trick (not counting the tricks needed to determine the partners after a Wedding has been announced), he has to announce either Re or Kontra. This is a 'forced announcement' (Pflichtansage). This variation is often played in games "without Nines". Some players even insist that a further announcement (i.e. 90) be made if the announcement in question has been made already. This rule is popular among recreational players in order to render the game more dynamic. Losing an Ace of Diamonds to the opposing team in the last trick of the game may lead to two extra points (instead of one) counted against the team losing the fox. When one player has both Foxes (Aces of Diamond) on his hand, he announces "Piglets" (Schweinchen). That means, that these cards become the highest trumps in play, outranking the Dullen (Tens of Hearts) and Alten (Queens of Clubs). It may be played that a Piglet forces the player to an announcement of Kontra or Re. Other variants include the announcement at any point during the game, often breaking the opposing team's bid or the possibility of Super-Piglets, if one holds both Nines of Diamonds. In some variants only the first played fox becomes a piglet at the top of the trump suit while the second one still ranks low. Only when Piglets is announced does Super Piglets become possible. When one player has announced Piglets and a player has both nines of diamonds on his hand, the player with the nines of diamonds may announce Super Piglets. That means, those Nines of Diamonds become the highest trumps in play, outranking the Piglets, the Dullen and Alten. As a variant, a Jack of Clubs may be also scored if a team loses it to the opposing team in the last trick. If a player loses their Jack of Clubs to their partner, no point is counted. Many groups play Lizzie Miller (Lieschen Müller or Karola Müller or Karlchen Killer): only if the Queen of Diamonds catches the opponent Jack of Clubs in the last trick one point is scored. A Charlie Miller lost to another higher Trump is not scored. Some groups of players use a rule that a player holding five or more nines (Fünf Neuner) may, before the bidding, reveal their hand and demand a redeal. Some groups that follow this rule also use a similar rules for hands with five or more kings. Tournaments are played over a series of sessions, each of 24 deals. Each session having 20 normal hands plus 4 compulsory solos (or 25 hands with five solos for five players at a table). Each player must bid one "compulsory" solo during the session. He/she may bid other "lust" solos if desired. The first solo each player bids is their compulsory solo, and they lead. Following the hand the same dealer deals again. A compulsory solo ranks above a lust solo in the bidding; if more than one player wants to play a compulsory solo, the bidding order overrules. If a player fails to bid a solo by the end of a session, an additional hand is dealt on which they must bid solo (vorführen (showing up)). The Essen System is a system of conventions used in Doppelkopf in accordance with the rules of the German Doppelkopf Association. ^ a b c McLeod, John. "Doppelkopf". Pagat.com. Pagat.com. Retrieved 28 July 2010. ^ "Das große Doppelkopf-Lexikon". Fuchstreff.